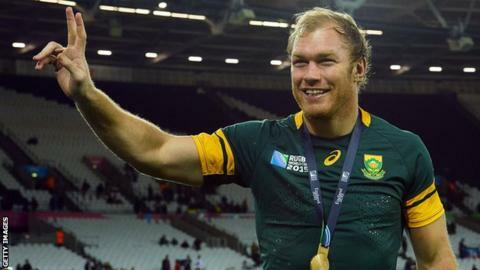 Premiership champions Saracens have agreed to sign South Africa flanker Schalk Burger on a two-year contract. The 32-year-old will move to Allianz Park in the summer following spells with Japanese outfit Suntory Sungoliath and Super Rugby side Stormers. Burger has earned 86 international caps and won the World Cup with the Springboks in 2007. "Schalk will add a huge amount of experience and quality to our young pack," said Sarries boss Mark McCall. "To be able to add one of the world's finest players to the group is extremely exciting. "He is a man who has achieved everything there is to achieve in the game of rugby." Burger made his international debut for South Africa in 2003 and has featured in four World Cups. He made seven appearances at the 2015 tournament and was widely regarded as one of South Africa's top performers as Heyneke Meyer's side recovered from the shock of losing to Japan to finish third. "I'm extremely excited to have the opportunity to play in both the Premiership and the European Champions Cup," said Burger. "Hopefully I can add a lot of value both on and off the field to an already successful group of players and coaches."